Over the spring, I had a little “knit elastic skirt” project. Last summer I went to a store and couldn’t find any. 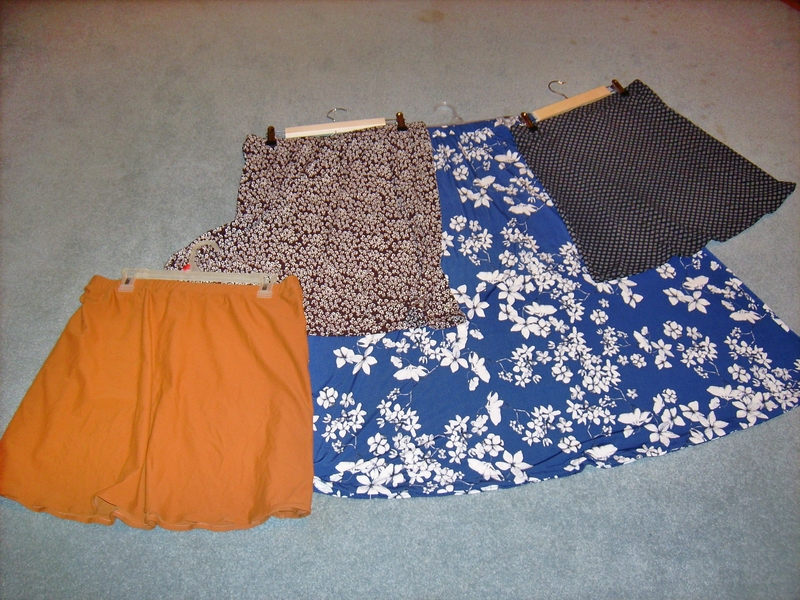 So this year, being proactive, I made about 8 different skirts so I would have plenty for separates over the summer. First up on the blog is McCall’s 6654 which was the second pattern I tried. I made two skirts of view F (19 inch length), one skirt in view G (23 inch length) and one skirt in view I (42 inch length). All skirts are from ITY knit. I did a larger hem allowance at 1.25 inches for 3 out of the 4 skirts. I also used size 16 for all of them. 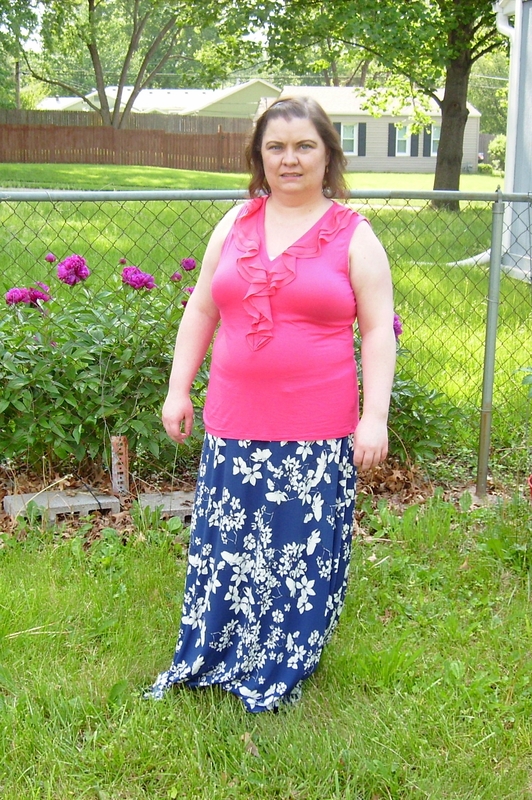 Only the maxi skirt had any major pattern alterations. First up the View F. I made two version of this view. The first was from the black patterned ITY. I used the 1.25 inches for the hem so it was above knee-length. As it was the first, I also had doubts so I took in the side seams some which I shouldn’t have done. The second View F (skirt 3 from pattern) is from a brushed sueded ITY knit. This fabric did not like heat at all. I burnt it with the iron which was set under 4 (just on the steam side). Because of that, I did a double folded narrow hem that I would not need to take the iron to. It is serged then rolled twice. Otherwise there were no pattern alterations. View G was the second version of the pattern completed. This time the only change made was to use the 1.25 inch hem. Everything else was according to pattern. Last skirt completed was View I (the maxi skirt). I knew immediately that 42 inches long was too much. I had my dad check the length I needed with a tape measure. It came to 36 inches. I ended up using 37 inches. I figured I would rather have the pattern piece too long instead of not long enough and I used a deeper hem (the 1.25 inches like previous versions). I started at the lengthen and shorten line and marked off every three inches 4 more times. At each line I took out an inch of length then blended the side seam from top to end of adjustments. I really like this pattern (I guess making it 4 times proves it). It was extremely versatile and allowed me to try out a midi length also. The pattern is extremely easy to sew together and would make a perfect beginner project. I think all total each version was probably about 4 hours from cutting to finished. It took two evenings to complete just because I don’t like fighting elastic late at night. It always seems to twist. It is also fairly easy to modify. I made my mom one for mother’s day and at the side seams to fit her. But she doesn’t like having her items posted to the blog.